An arc of emission just found in the Tycho supernova remnant provides evidence for what triggered the original explosion. Astronomers think that a shock wave created the arc when a white dwarf exploded and blew material off the surface of a nearby companion star. Tycho belongs to a category of supernovas that are used to measure the expansion of the Universe. This new image of Tycho's supernova remnant, dubbed Tycho for short, contains striking new evidence for what triggered the original supernova explosion, as seen from Earth in 1572. Tycho was formed by a Type Ia supernova, a category of stellar explosion used in measuring astronomical distances because of their reliable brightness. Low and medium energy X-rays in red and green show expanding debris from the supernova explosion. High energy X-rays in blue reveal the blast wave, a shell of extremely energetic electrons. Also shown in the lower left region of Tycho is a blue arc of X-ray emission. 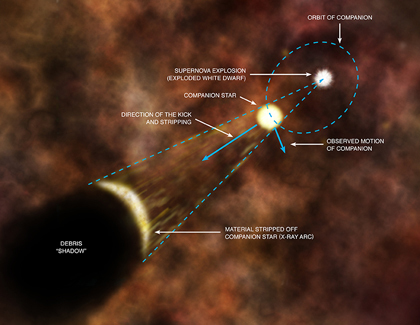 Several lines of evidence support the conclusion that this arc is due to a shock wave created when a white dwarf exploded and blew material off the surface of a nearby companion star (see accompanying illustration below). 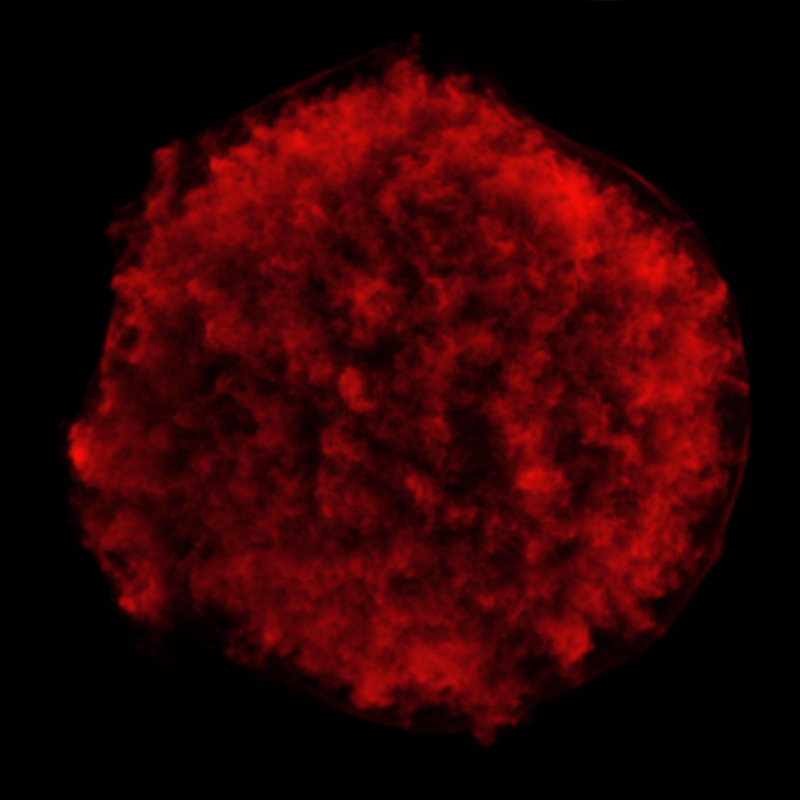 Previously, studies with optical telescopes have revealed a star within the remnant that is moving much more quickly than its neighbors, hinting that it could be the companion to the supernova that was given a kick by the explosion. Other details of the arc support the idea that it was blasted away from the companion star. For example, the X-ray emission of the remnant shows an apparent "shadow" next to the arc, consistent with the blocking of debris from the explosion by the expanding cone of material stripped from the companion. This shadow is most obvious in very high energy X-rays showing iron debris. These pieces of evidence support a popular scenario for triggering a Type Ia supernova, where a white dwarf pulls material from a "normal," or Sun-like, companion star until a thermonuclear explosion occurs. In the other main competing theory, a merger of two white dwarfs occurs, and in this case, no companion star or evidence for material blasted off a companion, should exist. Both scenarios may actually occur under different conditions, but the latest Chandra result from Tycho supports the former one. The shape of the arc is different from any other feature seen in the remnant. Other features in the interior of the remnant include recently announced stripes, which have a different shape and are thought to be features in the outer blast wave caused by cosmic ray acceleration. Coordinates (J2000) RA 00h 25m 17s | Dec +64° 08' 37"
Brilliant article & imagery. Makes me wish I was an astrophysicist. Thank you for posting and explaining this fascinating discovery for all to see. Space is indeed the final frontier! Amazing!! How wonderful is the Universe. Extremely concise, precise, well-written and explanatory text, with meaningful links. Does it not have angular momentum? The clouds are not layered. Photo pond splash ripples, some of the interior ripples undergo entropy, the rest undergoes expansion contraction. For some objects. What is the size of this object in kilometers? We live in the wondrous time of space exploration. We get to see some of the most astonishing sights of this amazing universe we are a part of, a very small part. Thanks for the beautiful work and explanation clear enough for a humanities teacher to understand. By the way, I saw this through APOD. What is the pin-point object in the upper left part of the image. Surely a SN-Ia doesn't leave a neutron star, and the image is made from detections in X-ray so it would have to be an x-ray bright object. The most amazing thing I've seen in weeks. I learned a huge amount from your informative well written and well illustrated page. fifty years ago. The little boy had curly hair and this really floored me. I have Chandra reports that are very interesting and I have many discussions based on your info and pictures sent to me. Friends who never showed interest in anything in space other than the NASA flights have become weekend panelist on Chandra submissions. Most interesting discovery. Ever since the space telescopes were put into orbit, so much has been discovered about this most marvelous universe we live in. The new discoveries never cease to blow my mind. Eagerly awaiting the next mind blowing discovery. A supernova remnant about 13,000 light years from Earth. 13,000 light years from Earth. Energy: Red 1.6-2.0 keV, Green 2.2-2.6 keV, Blue 4-6 keV. In the constellation Cassiopeia in Northern Hemisphere.